It's been a busy evening of blocking, but nothing is finished yet! I hate waiting. Until things are ready to show off, here is a shot of my very unglamourous workspace on the desk in our study/craft room/tool room! 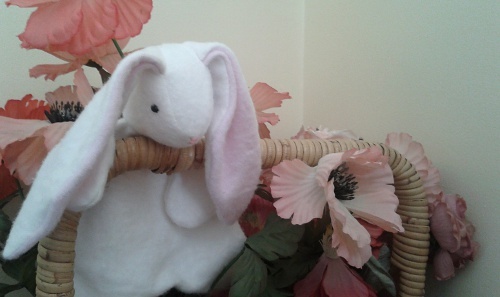 This little bunny has been waiting a while for the birth of her intended owner. Here is the card I made to go along with her. I wanted to coordinate by bringing in another bunny. 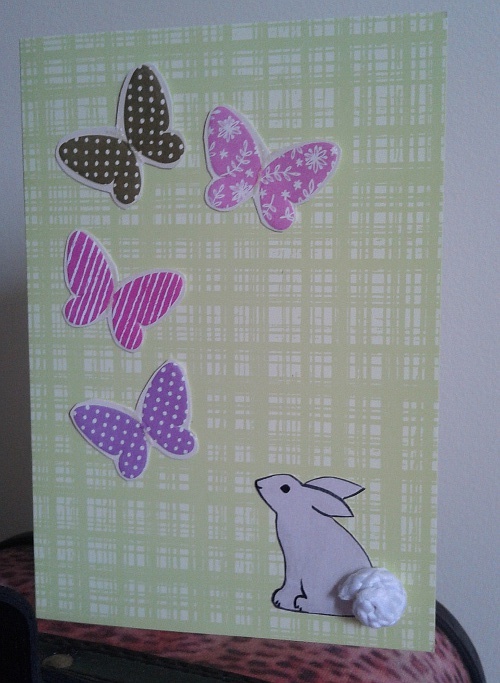 The butterflies are recycled from another card and the tail is a rolled up piece of cord from my ribbon basket. 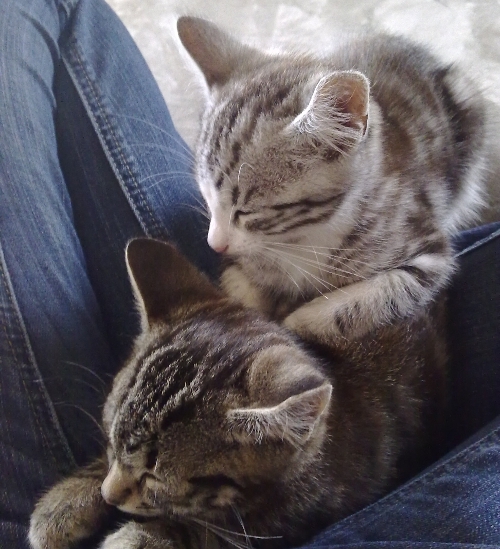 Today they've gone off to their new home to welcome the little arrival! Do you remember the underpants gnomes from South Park? No? This is the bit you need to know. In fact, it's the only thing I really remember about that episode. Over 4 years ago I first decided to launch a small creative business to sell my hats. 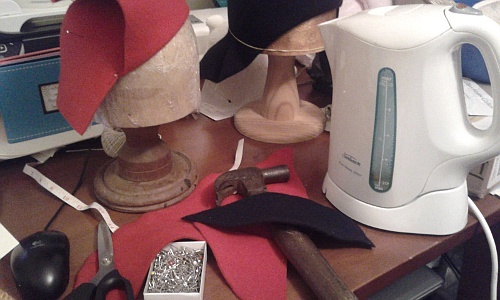 I was working part time, I'd just moved into my own place with plenty of space to craft and I was inspired by my first International Millinery Forum. Rejected and sad, I stopped. I got a full time job. I moved on. The problem was that my idea of a creative business was a lot like the vision of the underpants gnomes. Ok my first "launch" wasn't actually as dire as I made it sound. I did make and sell a couple of hats to a friend of mine, who loved my work, and that was incredibly satisfying. But it didn't occur to me that the big difference here was that she was the right audience for those hats, and saw them, and knew me, and various other things that made buying from me possible and easy. And it certainly didn't occur to me to think about how I was going to make that connection to others. So here I am again. Starting again. What is going to be different? This time, I am armed. Armed with knowledge. The best kind of weapon. I hope. I've read a lot about starting a creative business. I've had some more experience with blogging and other social network promotion. I've read other people's stories, and watched how successful craftspeople are doing it. I know that sales don't come immediately, and they don't come out of nowhere. I am ready to work and keep working and keep working. In short, I know a bit about Phase 2 now. I'm also not on the journey alone. 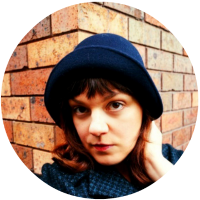 Rhiannon and I were going to start our creative business together, and began blogging as Jupiter Hollow, but as we prepared we realised how hard it is to align two creative visions. We have enough trouble being cohesive with ourselves! But we are going to be a little two-person network of support, guidance and inspiration for each other. So I'm off on this journey again, hopefully a little bit wiser. I'll be sharing more of what I learn about creative business here as the journey progresses. I'm guessing a lot people have been through this kind of awkward faltering attempt at something new. What lessons have your false starts taught you? What would you do differently next time?